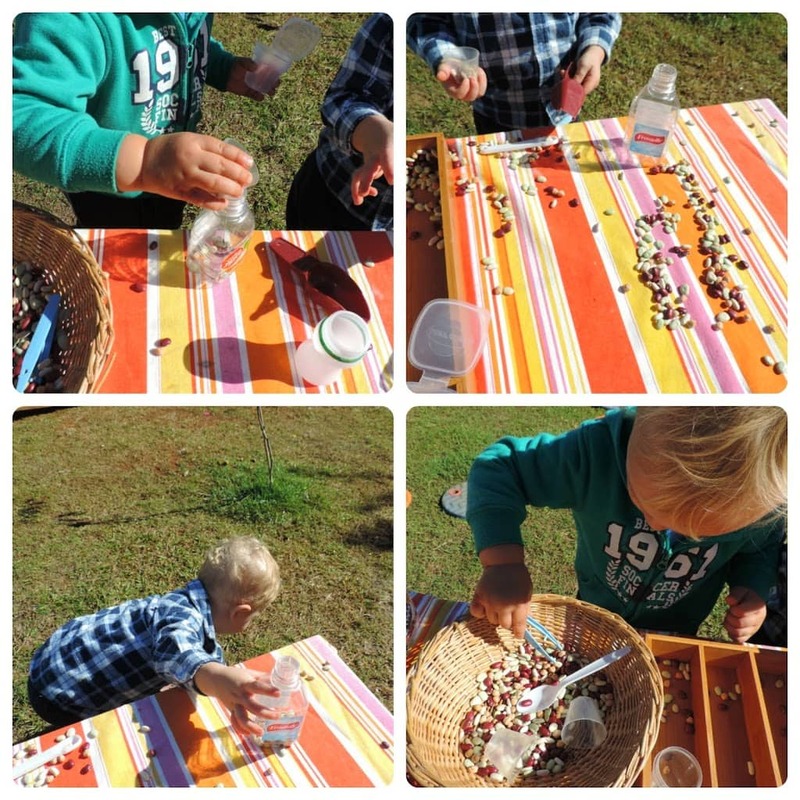 This easy activity evolved from an emerging interest in musical instruments and sound by my family day care toddlers. 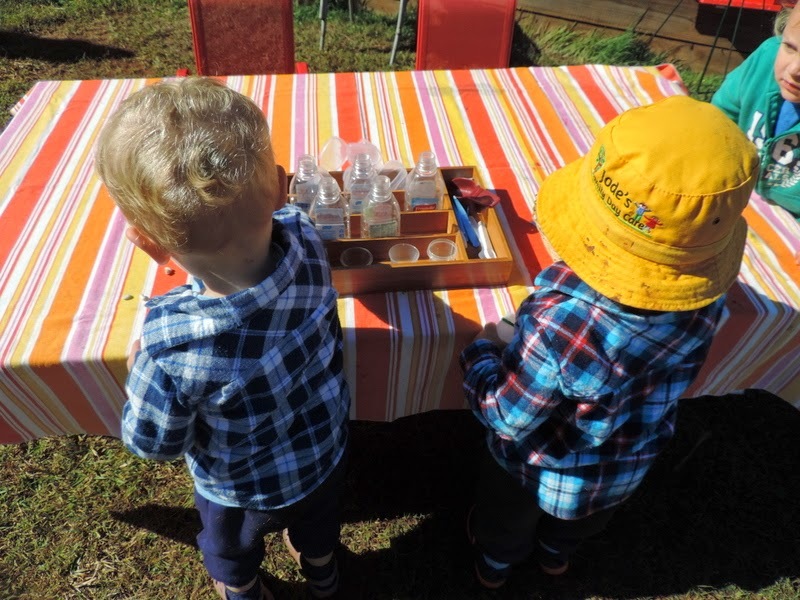 They are particularly excited by the homemade shakers and glitter bottles I have around on the shelves so I decided to extend upon their interest by helping them to make their own mini music shaker bottles. Now i’m pretty sure you don’t need me to tell you how to make the shakers in great detail. Put some beans or rice into a bottle, seal and then shake of course! 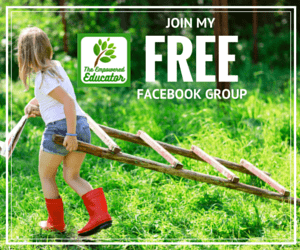 However, why I wanted to share this activity is to show how you can turn something simple into a wonderful learning experience offering so many possibilities. 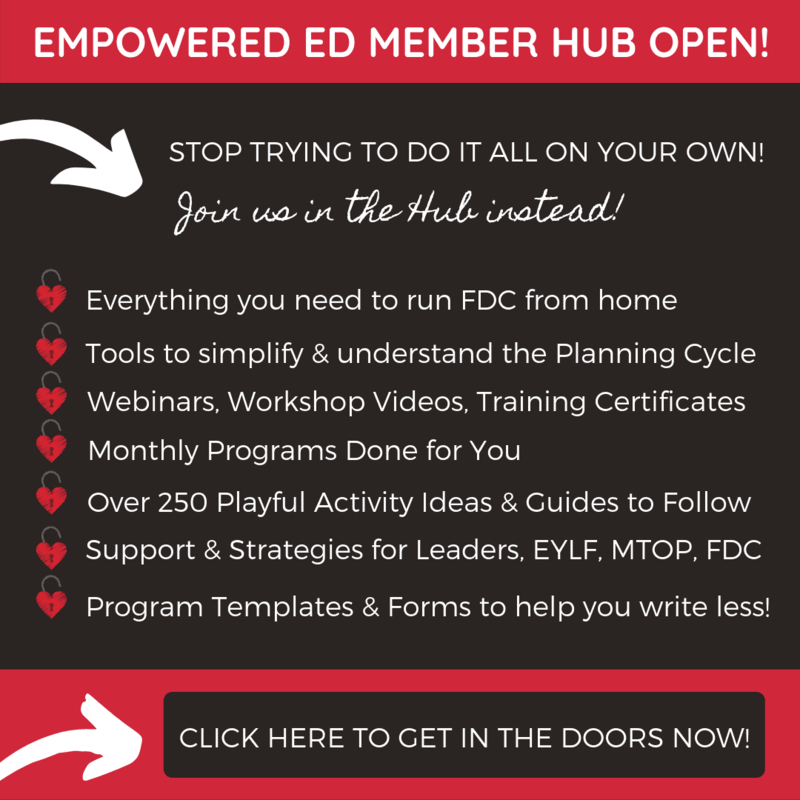 You can share the same concept at home with your child or with a group of children if you are working in the early childhood field. 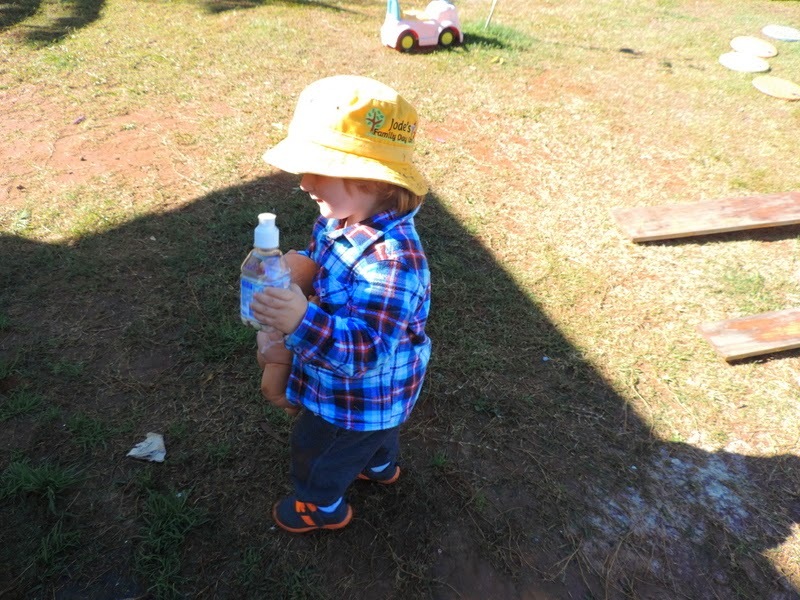 It works for all toddlers and is easy enough for anyone to pull together quickly. Beans, rice or anything else you have going out of date in the cupboard that makes a noise! A tray to hold the bottles steady while they fill is a good idea. 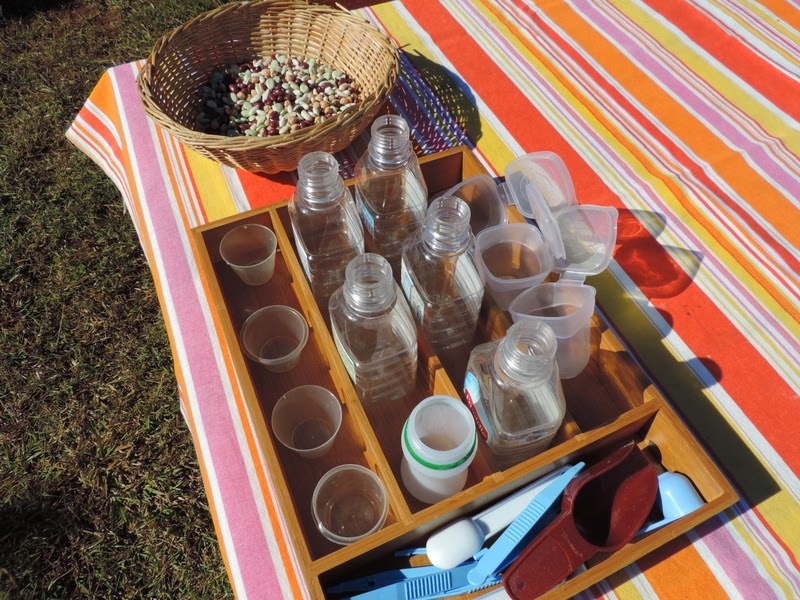 I also added a few old medicine cups and baby food storers with attached lids. 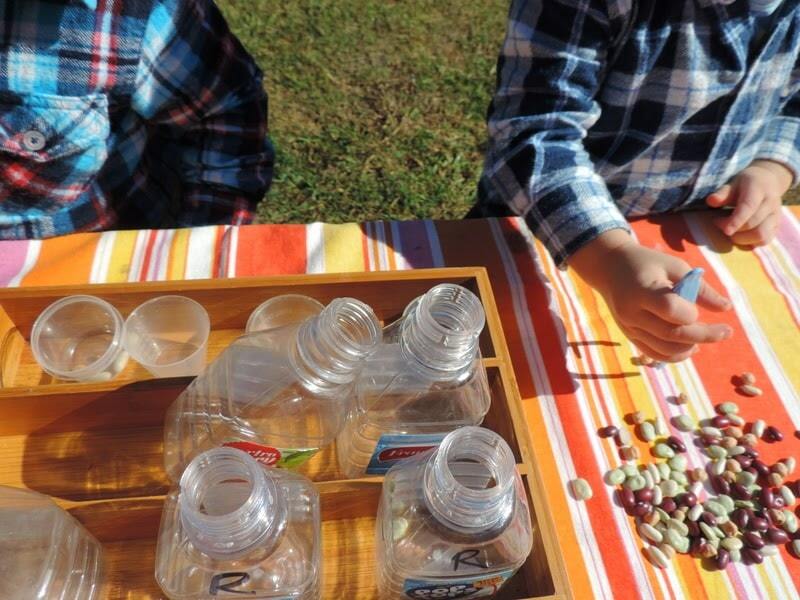 This gave those toddlers getting frustrated with the bottles an easier option and allowed for some fine motor practice and task achievement while still participating. The baby food containers (I use to freeze the twins vegies in them) made great shakers too. 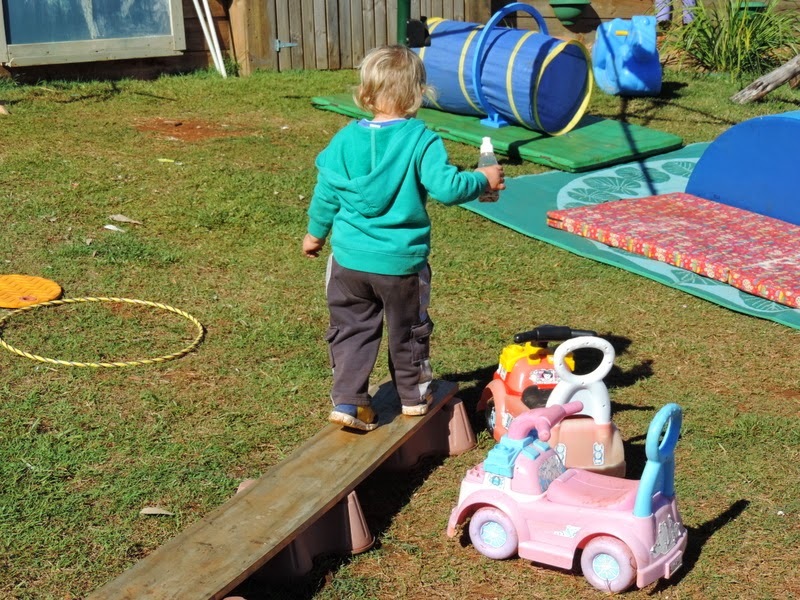 Always important with toddlers to work with their skill and comfort level…work from one level and support them to reach the next level by offering more difficult options with any activity you offer. By adding just a few different options to this tray I could include everyone immediately and then work with everyone at their own particular level. 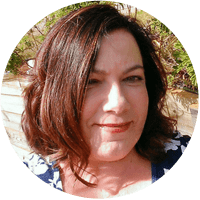 When a toddler gets frustrated they will just give up and walk away…your job as parent and/or educator is to ensure you can support them to problem solve, communicate and participate in a way that keeps them interested and experiencing a sense of self worth. immediately they all had a try and used them in different ways. 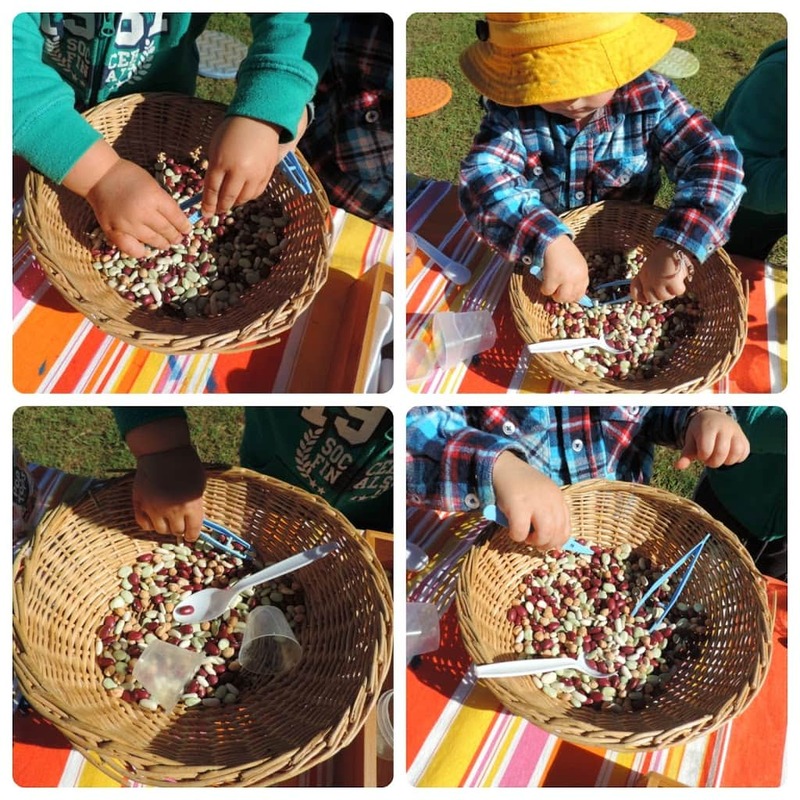 Squeezing and releasing to pick up the beans was the first goal, the next was squeezing and holding using their fine motor muscles to transfer. 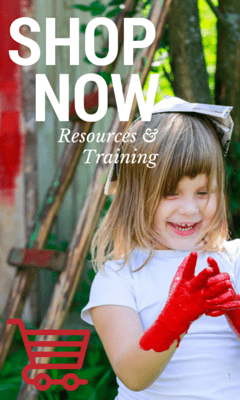 Another important thing to remember when playing with toddlers is to allow them to explore and experiment…it might not be the ‘right’ way to achieve the goal in your mind but it is their way of problem solving and completing a task. If we jump in to early we run the risk of missing a valuable learning opportunity. I found it fascinating to watch how they each approached the task in different ways. Some spread the beans out on the table for easier access before trying the tweezers again…. 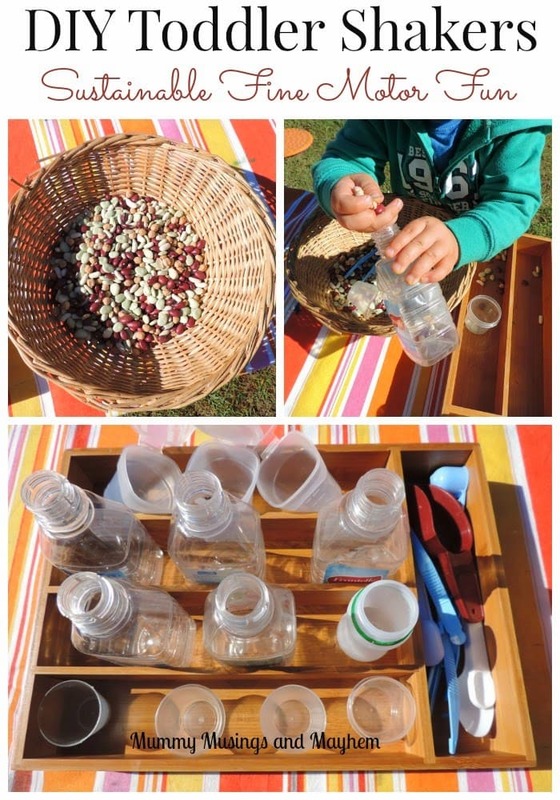 But the common theme was that they all began to fill their bottles in various ways and with much concentration….the tray really helped when some were getting frustrated with them falling over as they added beans. 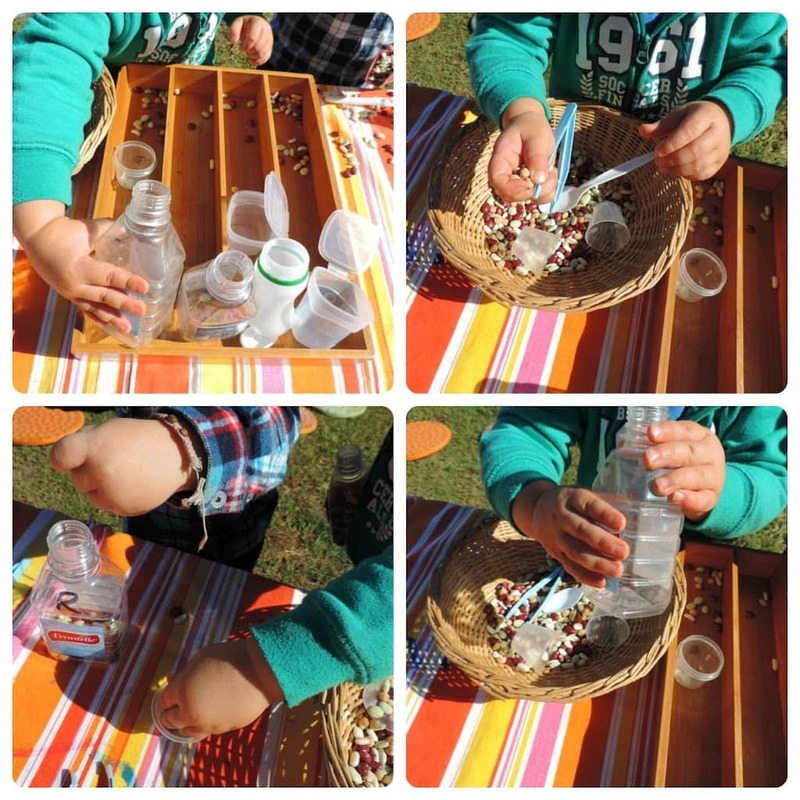 It was a good learning opportunity to show them how they needed to support the bottle with one hand as they filled. Another little tip…you’ll notice we are doing this outside. Why? Because it was glorious in the warm Winter sun so why wouldn’t we? But also because they are toddlers and they spill, tip, run off and drop. And beans go everywhere on a wooden floor. And I do mean everywhere, I was finding those suckers for weeks after I last did an activity inside with them and that was with the older kids!! You’ll often hear me say I prefer to do messy and craft activities outside. 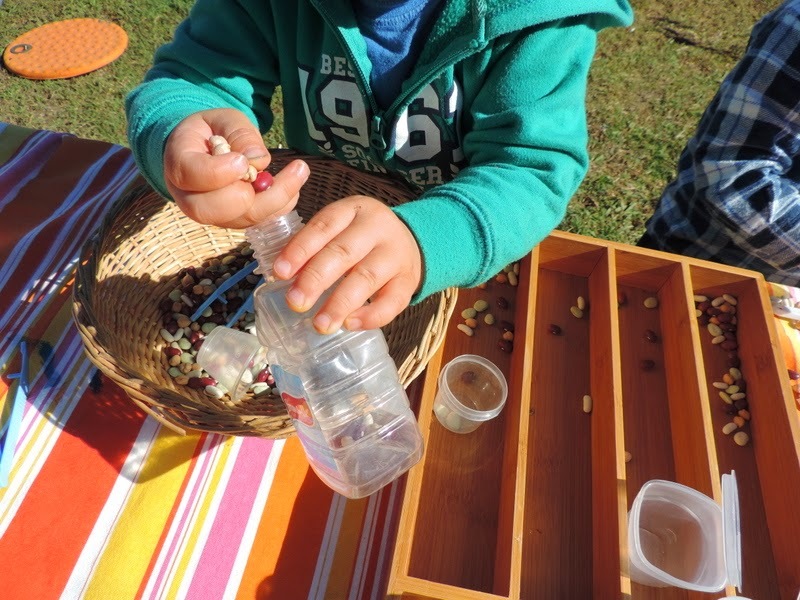 It’s not just so I don’t mess up inside it’s because it allows them to come back and forth to an activity, explore the materials, make a mess, problem solve and usually add things from the environment around them as they find them! 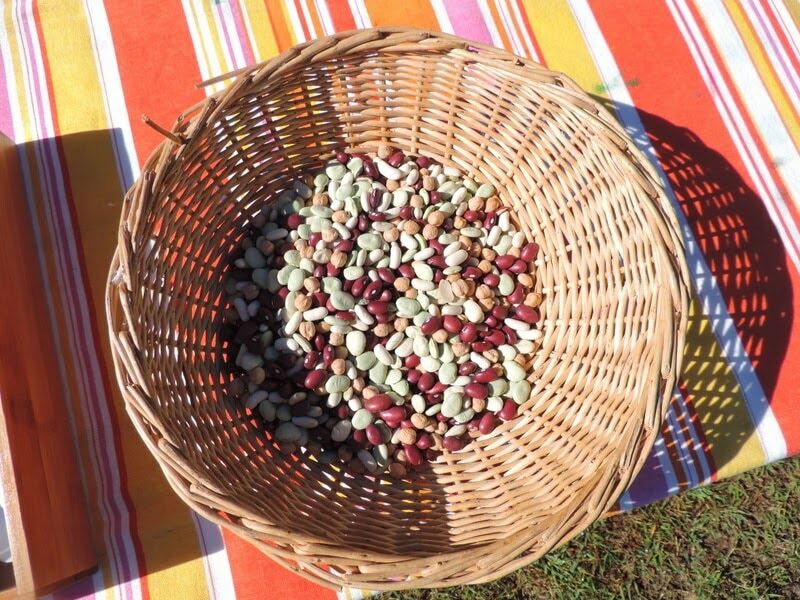 As they filled we talked about the beans and what we might be able to grow with them. One of the boys wandered off to ‘plant’ his in the garden and sandpit so we shall see what happens there! When they were happy with the sound the shakers made I helped them try to screw on the lids and then they were off around the yard to make some music…. And the parents looked so pleased at pick up time when they were handed a child making lots of noise…and even more pleased when I said they could take them home! What does a child experience with this simple activity? A sense of pride and self worth as they explore a new skill. They are extending upon an interest and actually finding a way to achieve an end goal. 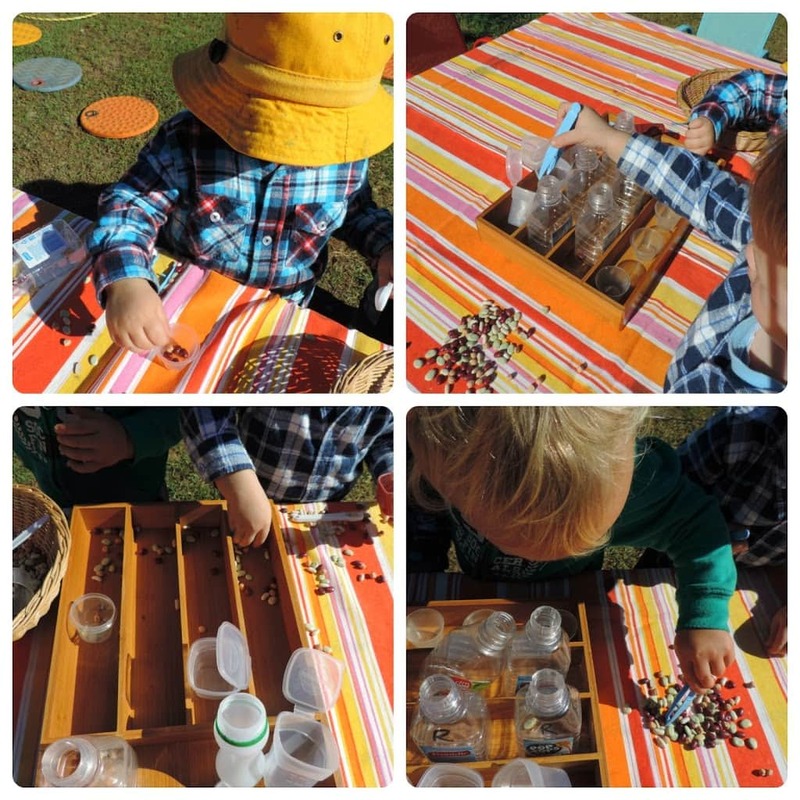 They are strengthening their fine motor muscles, control and coordination. They are learning about using sustainable materials and recycling. They are using their thinking and reasoning skills to problem solve. They are communicating and using descriptive language. They are making music and different sounds. 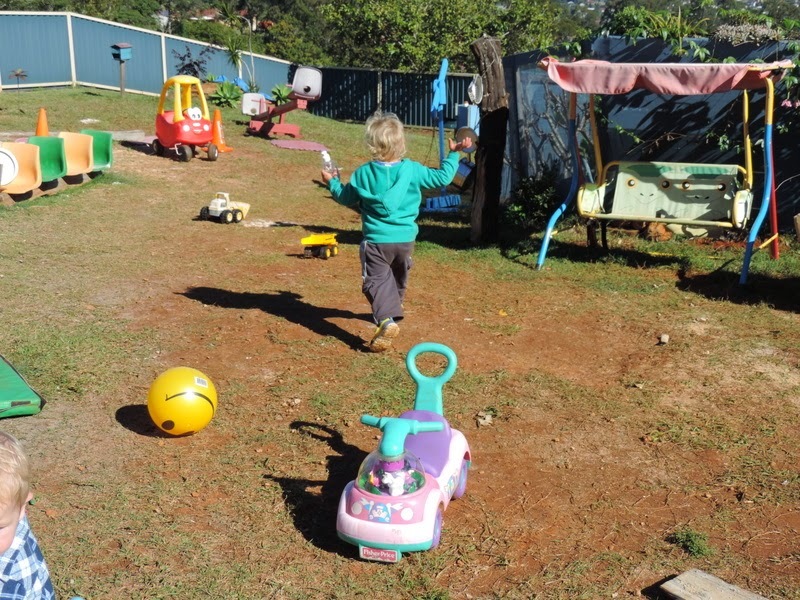 They are happy and HAVING FUN in their own way…but they are learning! What does your toddler like to use to make music?